, will help you avoid version conflicts when editing Microsoft Office files in Google Drive. Real-time presence will let users know if another user is editing a Word, Excel, or PowerPoint file stored in Drive File Stream, in real time. This feature will start rolling out to end users on October 17th. See this demo recorded at Google Cloud Next 2018. Read our previous blog post describing the feature. Admins can choose whether to make real-time presence available to their organizations. Admin controls are live today and on by default. Real-time presence can be disabled for an entire domain or for individual organizational units (OUs) within a domain. To change the setting, go to Apps > G Suite > Drive and Docs > Features and Applications > Allow users to enable real-time presence in Microsoft Office from Drive File Stream in the Admin console. For more granular control, admins can also deploy a configuration setting to enable or disable real-time presence in Microsoft Office on a per-machine basis. On October 17th, Drive File Stream users will begin to see an educational message when opening Office files stored in Drive File Stream. This message (pictured below), explains that real-time presence helps users see who is editing Microsoft Office files stored in Drive. After opting in to this feature, users will begin to see real-time presence status indicators in the bottom right-hand corner of Word, Excel, and Powerpoint windows that are focused in the foreground. On macOS, enabling real-time presence may require users to grant accessibility permissions. Additionally, some users may be asked to confirm their identity before using real-time presence, by logging in with their G Suite account. Starting October 17th, employees at G Suite organizations will be able to visit our Help Center to learn more about how to use real-time presence. On October 17th, 2018, we’ll begin rolling out real-time presence for Microsoft Office files in Google Drive to all G Suite domains. Admin controls for real-time presence are available today. This feature, included in Drive File Stream, will help you avoid version conflicts when editing Microsoft Office files in Google Drive. 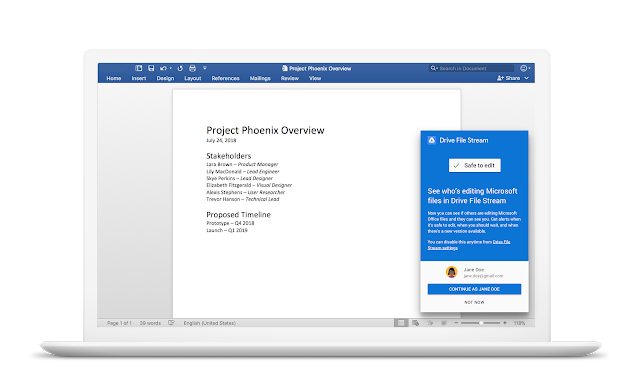 Real-time presence will let users know if another user is editing a Word, Excel, or PowerPoint file stored in Drive File Stream, in real time. This feature will start rolling out to end users on October 17th.